Fans of Fox's animated sitcom 'Bob's Burgers' will recall the pilot episode in which the Belchers are accused of cooking their hamburgers with human flesh. A comical food safety inspection ensues and the family's monotone humor has inspired a cult following for five seasons going on six next month. One of the staples of the show, a blackboard displaying pun-filled "Burgers of the Day," inspired a college student with very little cooking knowledge to start a blog called The Bob's Burgers Experiment, in which he cooks burgers named on the show. The Texas Chainsaw Massa-Curd Burger, for example, or the Hummus a Tune Burger. The blogger behind the project, Cole Bowden, has made the most of the opportunity, having met the show's creators and formulated an idea for a physical cookbook. 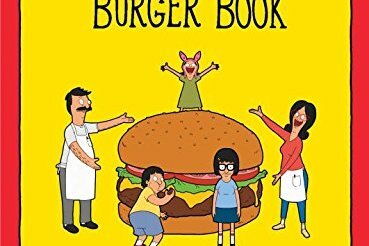 Today, Bowden released an image of the book cover for 'The Bob's Burgers Burger Book,' which is due for publication next March. In a recent interview with Paste, Bowden explained how his idea took form. During my senior year, as my roommate and I were binging on 'Good Eats' episodes, I realized that I wanted to learn how to cook. Not just follow recipes and heat things up, but really learn to cook. I needed some sort of platform to help me, something easy to experiment with and try out different flavors and types of cooking. We were watching the first season of Bob’s Burgers when it hit me: Hamburgers! Hamburgers could be dressed up in a million different ways, and best of all they’re cheap! For those who don't feel like waiting until next year to get started on burger experiments, recipes for Bowden's burgers can be found here. Pre-orders are available at Barnes & Noble and Amazon.